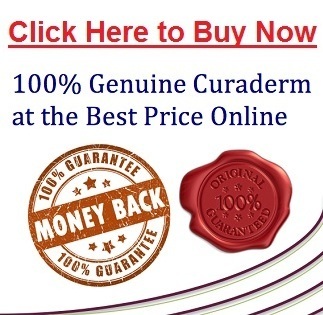 - Curaderm BEC5 Eggplant Extract cream known as Curaderm for the alternate treatment of skin cancers such as Basal Cell Carcinoma, Squamous Cell Carcinoma. 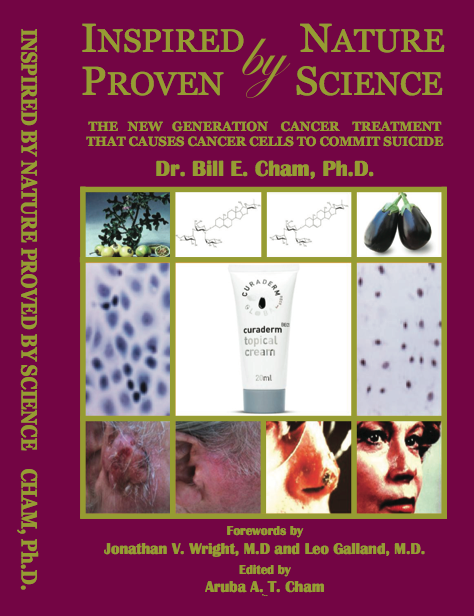 Curaderm is the Eggplant Skin Cancer Treatment By Dr Bill Cham for non-melanoma skin cancers and Actinic Keratosis. • Skin cancer is more prevalent than all other cancers put together. • More than 2 million Americans develop skin cancers each year. Some 40 to 50% of Americans and at least 1 in 2 Australians who live to the age of 65 will be diagnosed with skin cancer. • The incidence of skin cancer is increasing at alarming rates. • Every major public health authority – the FDA, National Cancer Institute and International Agency for Research on Cancer – has concluded that sunscreens alone do not reduce the rate of skin cancer. • There is no strong evidence that sunscreen use prevents skin cancer as shown by independent researchers. • Sunscreen users are at increased risk of melanoma. Higher, not lower, incidence of melanoma occurs among frequent sunscreen users. • There’s no proof that sunscreens prevent most skin cancers. • The etiologies (causes) of non melanoma versus melanoma skin cancers appear to be different. • Vitamin D produced by the skin with the help of the sun’s UV can reduce the risk of melanoma and other types of cancer. • High-energy UVB rays burn skin and directly damage skin DNA. • UVA radiation penetrates deeper into the body than UVB and can cause a different type of DNA damage than UVB. UVA also causes premature wrinkling and signs of ageing. • SPF rating describes the product’s ability to prevent burning and not a rating to prevent skin cancers. • In addition, almost all widely used sunscreens contain ingredients that actually cause cancers. In light of the shortcomings of today’s sunscreens, new approaches must be adhered too. The ideal sunscreen would completely block the UV rays that cause sunburn, prevent immune suppression and damaging free radicals but not affect vitamin D production. The UV absorber or UV blocker ingredients should be safe and the sunscreen should remain effective on the skin for several hours and not form harmful ingredients when degraded by UV light. There is currently no sunscreen that meets all of these criteria. Today’s sunscreens give false sense of security and consequently people, when using the inadequate current sunscreens, remain longer in the sun and the incidence of skin cancer increases. The uncertainties of safety and efficacy of sunscreens have necessitated the development of a sunscreen that attempts to minimize the negative effects of current sunscreens. Overwhelming scientific evidence show that BEC glycoalkaloids extracted from Solanaceae plants kill existing cancer cells and, also kill cancer cells when they are just being formed and starting to grow. BEC glycoalkaloids also stimulate the immune system to kill cancer cells. BEC glycoalkaloids in a cream formulation – Curaderm BEC5 – effectively and safely treats nonmelanoma skin cancers. 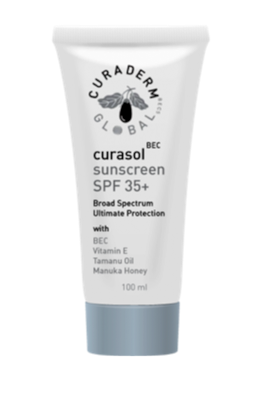 These same anticancer BEC glycoalkaloids are present in an unique propriety sunscreen – Curasol BEC – and together with other ingredients Curasol BEC is a most effective preventative of skin cancer. By Dr Bill Cham Ph.D.